The application of AI within finance is challenging for a number of reasons. Financial time series suffer from low signal-to-noise ratio. As a result, there are a small number of useful signals that must be extracted from the noise by the AI techniques. We curate the data fed into the AI system, so that it can spend more time on finding relationships which make economic sense, rather than re-learning relationships we already know. Regimes change, and with them, the distributions representing the data series. AI systems need to take into account these continual shifts in order to be effective. 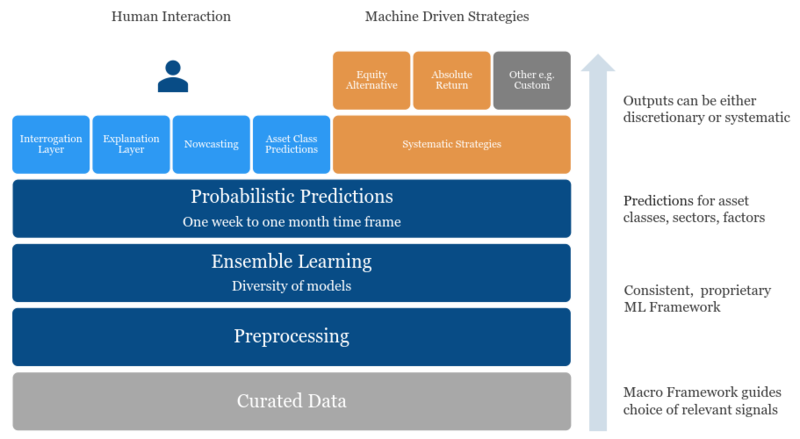 Using our financial AI expertise, we’ve selected particular models which work well in representing complex, non-linear, time varying relationships. Proprietary versions of these models form the backbone of our AI predictions. Although there are large amounts of high frequency trading data available, for certain datasets (and in particular macro data), the sample sizes are relatively small. In addition, there may only be one or a few instances of certain types of events to train a model on – for example, the 2008 financial crisis. We believe understanding what state the system is in and what it might do next, is a fundamental design principle. Being able to provide an explanation to investors of past and potential decisions is therefore possible. The Global AI Allocator, or GAIA, is our proprietary platform that incorporates signal processing, machine learning, and other techniques in order to provide predictions for asset classes, sectors, factors, and currencies globally. These predictions can be used as part of a discretionary investing process, or alternatively used to create systematic investment products. Predictions are made on a one week to one month time frame. Transparency has been part of the design from the outset. Members of the team can interrogate the system and see what relationships have been learnt, and what state the system is in at a point in time. Also, explanations of past and potential investment decisions can be communicated to investors. In addition, our models require acceleration, and so we use Graphics Processing Units, or GPUs, as the standard processor for calculations. We’ve also developed a faster, Field Programmable Gate Array (FPGA) version, which runs on the cloud. Predictions for asset classes, factors, sectors, and currencies – which can be used for trading decisions, risk management, and creation of macro overlays. Systematic strategies derived from the predictions – for example, an investment strategy which allocates between global Equities and Bonds, implemented using low cost, efficient, ETFs. Macro indicator predictions – for example, nowcasting and nearcasting industrial production.